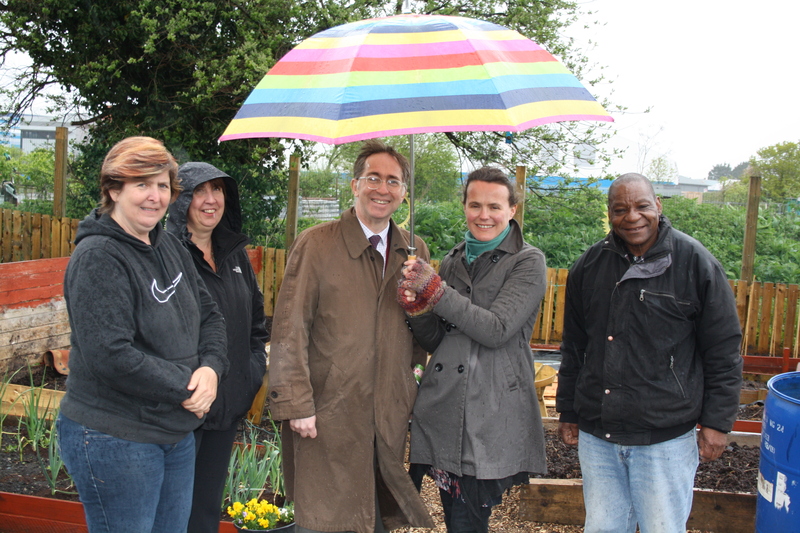 We have had some good feedback to a recent visit by Welsh Assembly Member David Melding to the allotment project. He arrived with his colleague as a forecast storm started, but it didn’t dampen the spirits of Mr Melding or the allotment plot holders who greeted him. The event was arranged by the Federation of City Farms and Community Gardens, who have been strong supporters of our project over the past 18 months. Mr Melding spent some time chatting to the tenants about how the project was set up, how they benefit from growing their own food and about the training courses run on the site. One tenant produced a potted strawberry plant for Mr Melding’s aide, after hearing he’d had difficulty with his own plants! That was a nice touch. 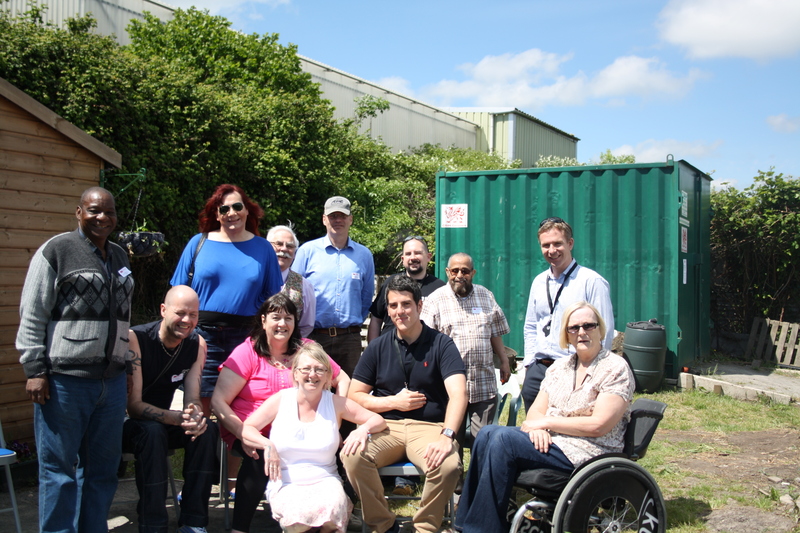 During his visit to the Leckwith and Drove Allotments, Mr Melding also visited our neighbours, the Growing Green mental health project, which was also a successful stop-off. Many thanks to the tenants for coming down to the site for the visit – and for giving a good account of themselves and the project. Federation of City Farms project officer Emma Williams said the Taff project had shone during the visit – despite the horrible conditions. 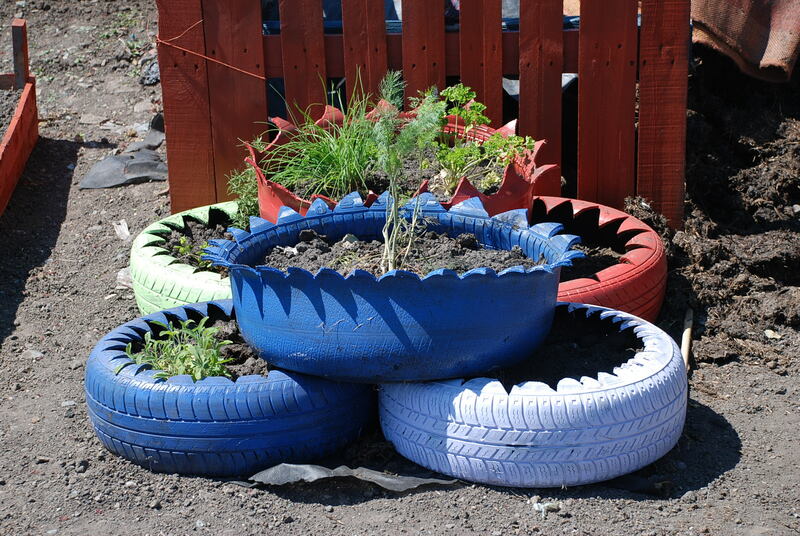 Mr Melding had discovered, she said, the importance of community growing projects to local people and how it can transform people’s lives for the better. 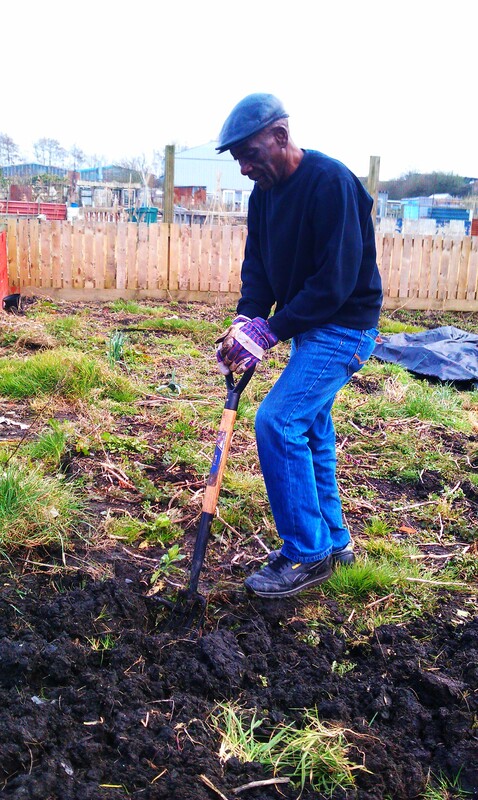 A team of volunteers from a homeless project has officially joined in the Taff Community Allotment Project – a big welcome to them. Mandy Powell, a Taff tenant, is involved in the Impact homeless project at the City Temple in Cardiff City Centre. 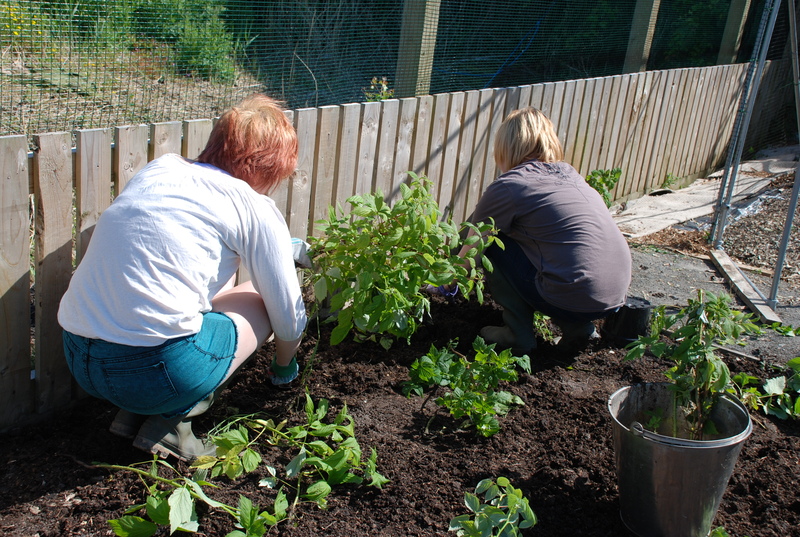 Last year, Taff tenants and staff volunteered to grow some vegetables for the project. 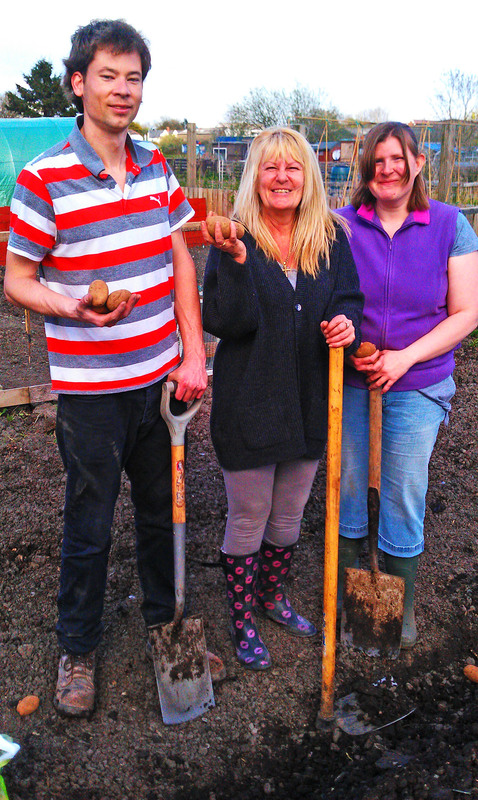 Now, Mandy and volunteers Dan Thompson and Claire McMahon are involved in taking on a vacant area on the Taff site to grow veg for healthy meals for the homeless on Saturday nights. Having rotivated their plot last week, turning in some well-rotted manure, the team spent Tuesday afternoon on the allotment digging in rows of potatoes, planting onions and building a seed bed from old scaffolding boards. This is a great step forward for our allotment project, as it means the City Temple volunteers can grow more vegetables and help feed more people. I have heard more about the Impact project from Mandy and it sounds a terrific scheme, helping people get back on their feet and giving them support and confidence. Meanwhile, the allotment training course has been revitalised. Numbers were flagging a couple of weeks ago in the site shed on part one of the 15-week session. With a burst of promotion on email, telephone and Facebook and just by chatting to lots of people, we have found another six starters taking us up to 12 learners. They will be learning in the coming weeks about pests and diseases, crop rotation, how to work with polytunnels and greenhouses and lots more. The learners on the training course were treated to a close-up brush with nature this week! 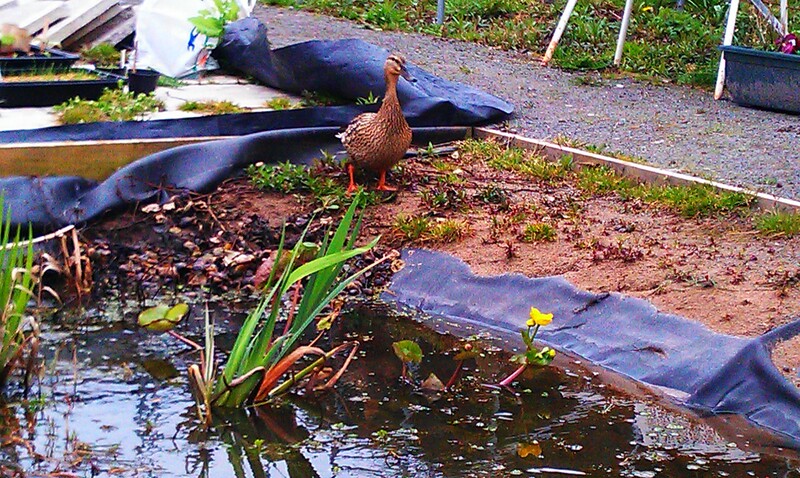 While they were outside the training shed with tutor Aisling, someone noticed a mallard duck had flown on to the allotment pond, just metres from where they were standing. The curious thing was, the same duck was being chased around by three drakes above our heads for about half an hour beforehand! Clearly in need of some time to get away from all that excitement, she spotted the pond and dropped down for a bite of fairy weed, which covers the pond and is a delicacy for ducks. Curiously, as the phone cameras appeared, she stopped and looked put out by the ‘paparazzi’ attention, staring back at the learners! It was a great sight and a pleasure to have an unexpected guest sharing a moment with the class. There have been other wild ducks which have settled on the much larger allotment site pond about 300m away – indeed last year they reared a brood of eight chicks on the pond. Well, the frustrating ‘spring’ weather appears to be finally over and we can get on with some proper gardening! It’s been difficult juggling the problems of the weather and all the work that needs to be done on the site in preparation for the spring. Normally, you have better weather in March to spread things out and get things done at a steady pace. This time, it’s been a late start on the site and a bit of a rush to get things sorted. However, I am pleased to say, we are getting more new faces involved, who are both enthusiastic and hard-working, which is a great combination. Two of the poorest plots on the site at the end of last year, which had not really been well looked after, are now being overhauled. The one has been fenced off by new tenants Alan (pictured) and his friend Trevor. They’ve been busy fencing off their section, turning over the soil, building cold frames and getting some plants in the ground. Next door to them, two friends who volunteer with the City Temple Homeless Project, have taken on a section, which they have rotivated in readiness of planting. They are hoping for a good crop of root vegetables, which will end up in the pot for stews and casseroles to feed people in need on Saturday nights. This is a great project and I have been learning more about it lately, speaking to Mandy about what a difference it makes to the lives of the people she and the other volunteers come into contact with. Elsewhere, other tenants have been busy on their own plots, getting in potatoes, adding manure to their plots freeing volunteers up to tackle the Community Growing Space, raised beds and fruit cage. There’s gradual work going on at each of those sections. The first early potatoes (Kestrel, Pentland Javelin and Maris Bard) have been planted in the community space, along with late garlic and compost has been bought to top up the raised beds. We are looking at ideas for the raised beds this year, as the expected bumper crop of tomatoes was hit by horrible blight and we only managed to save about 10% of about 400+ tomatoes, sadly. We also don’t want to re-plant tomatoes in those beds, in case the soil is still carrying any trace of the blight. Unlikely, but not worth the risk. Meanwhile, the allotment training course is ongoing, although the numbers have dipped this time, meaning we’ve been rushing around trying to get more involved. Fingers crossed, one or two more people will get on the course so it can continue! So, a late start, but plenty going on and worth reporting about on the blog. We hope to have some more interesting and exciting news to come, once it is confirmed. We’re delighted to announce there will be a new course, Basic Gardening Skills, starting later this month. Fresh from the success of the Pests and Diseases course, which the participants enjoyed, tutor Aisling Judge has started signing up recruits for the new course, which starts on February 19th and will run for 15 weeks. I can’t believe that it’s not even 9 months ago since we started the training in Growing Green’s own meeting shed. Since then, we’ve had two more successful courses in the Taff Community training shed and this will be our fourth course. This is a good opportunity to thank tutor Aisling for all her work with the learners and for keeping them motivated over the cold winter months. It’s a logical time to be doing things like training on the one hand, but getting people to turn up in the cold, rain and snow is something quite different. I was very impressed with the learners information displays about pests and diseases and I look forward to seeing everyone putting their new found knowledge to the test this year – although, hopefully, there won’t be as many bugs and diseases as we battled with last year. Meanwhile, we’re looking at investing in some cheap membrane to cover a small area of weeds and improving the signage and layout of people’s plots, so everyone knows who’s where in 2013! We’re expecting most people to trickle back and begin working the plots and communal areas as the weather gradually improves – all the ‘old timers’ on the site have dissuaded us so far from planting garlic and onions, as it’s been perpetually wet and cold for months. But we must get them in later this month or miss our chance. Plus, there are plans to install the guttering on the training shed roof, now the weather is improving (slightly!) and we’re chasing some funding for a few project ideas we have on the site. In fact, the funding meetings have kept us busy for some weeks, behind the scenes, as we look to improve upon the site infrastructure. More about this in future posts. Someone suggested linking a photo from sunnier days, to keep us motivated!